Solar hot water installations used to be time consuming…and sometimes annoying. Mounting and plumbing the critical components such as the pump, the controller and more, used to take up hours of time that could be spent on additional installations, and forced you to charge your customers additional labor charges…the UniMaxx solar hot water pump stations eliminate much of the hassle and time spent installing SunMaxx solar hot water systems. UniMaxx solar hot water pump stations have been tested in the world’s most mature solar markets…and are now available for our US dealers and installers. A team of brilliant engineers have spent countless hours fine-tuning the UniMaxx solar hot water pump stations to ensure that each station cuts the time and cost of solar hot water installations, and becomes one of the most valuable components of any SunMaxx solar hot water system. 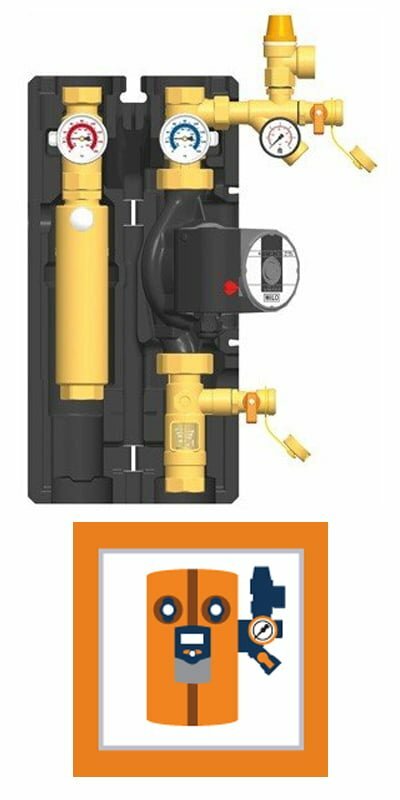 Check valves and flow meters are installed at every key part of the solar system, making maintenance and diagnosis of problems hassle free. By also incorporating the advanced SunMaxx digital controllers, this solar station truly brings solar thermal to the next generation of reliability, efficiency, and ease of installation, use, and repair. These modular systems make design changes and customization easy. Brass is exclusively used for any part in contact with water, with precise sealants making these stations highly temperature resistant. The insulation of the SunMaxx UniMaxx systems meet all requirements for heating systems and are designed to combine these parts into one sleek, aesthetic package.